OK, you’ve stumbled across this sewing blog and are intrigued. It could be the amazing quilting roundups, the tips and tricks, or the colors, but something holds your attention. “Maybe I should start sewing,” you think. As fun as it sounds, purchasing a sewing machine is a heavy investment to make on a whim. 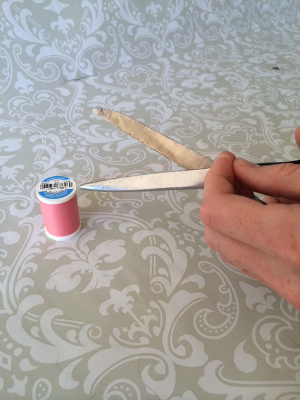 To ensure you want to pursue the best craft that has ever been conceived, why not first try sewing by hand? 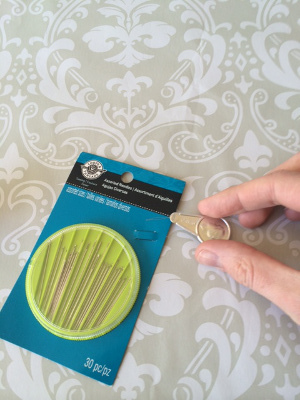 Come on, you know at the very least you have a hand sewing kit. You either got it from a hotel back in the ’90s or your mom gave it to you before you went off to college. Let’s break it out and thread a needle together. 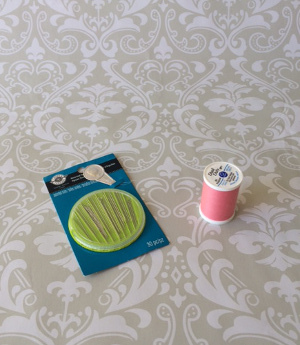 We’re approaching this extremely basic sewing tutorial with the bare essentials. You’ve got a spool of thread, needles, and a threader (we’ll talk about the threader in a moment). First you’ll learn the intricacies of threading a needle by hand. 1. 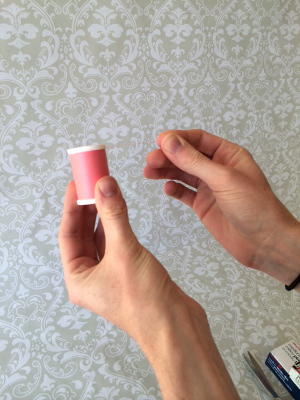 Take your spool of thread and locate the tail end of the thread. It will be tucked in on either the top or bottom of the spool. Pull it out so that the thread unrolls neatly off of the spool. 2. Designate a needle you’d like to use. 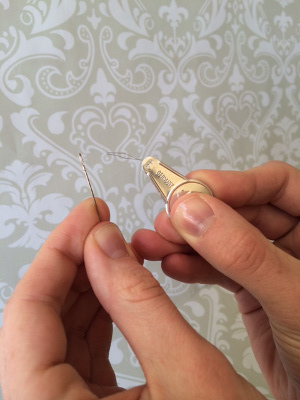 The needle should match the thread size, but for beginner purposes, just ensure that the eye of the needle is large enough for your thread to go through. 3. 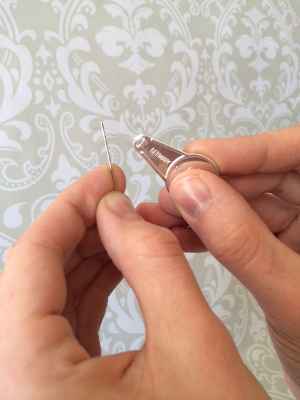 Cut the end of your thread at an angle so that it is slightly “sharper” and easier to put through the needle. You might also choose to wet it by moistening the tip of the thread with your mouth. 4. Hold the needle up so that when you look straight at it, you can see through the eye of the needle. 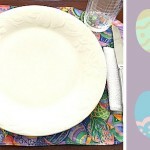 Utilizing a background of a different color and a lot of light is helpful for this. 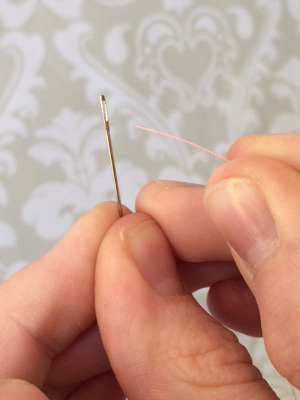 With one hand holding the needle and your dominant hand holding the thread, carefully aim your thread at the eye of the needle. 5. This process is made easier by holding the thread near its end to allow for less flexibility when the thread hits the eye of the needle. It might take a few (hundred) tries, but be patient; you’ll get it! 6. Once the thread makes it through the eye, pull as much thread as you need through joyously. 7. Knot the end and rest (or sew). You know that thing that comes with packs of needles? It’s often metallic and looks like a coin with a witch’s hat on? (I’m sure there are better ways to describe that). It’s called a “threader”, and it can virtually speed up the process we just described by tenfold. 2. Hold up your designated needle, with the eye facing towards you. Pick up the threader and hold it by the round base. Push the wire tip through the eye of the needle. It will bend to adjust to the size of the eye. 3. 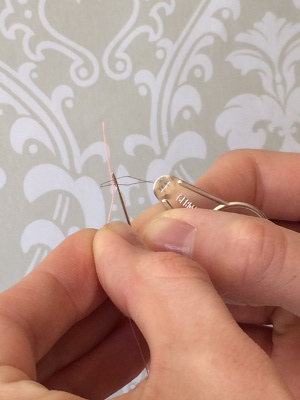 The reason why the threader works so well is because the wire hoop pushes through the eye of the needle much more easily than a flimsy piece of thread does. Where a thread will fray and split its end when confronted with a small eye of a needle, a needle threader will just push right through. 4. When part of the wire hoop is pushed through the eye of the needle, take your thread and put it through the threader’s wire hoop. Put a substantial length of thread through this hoop. 5. 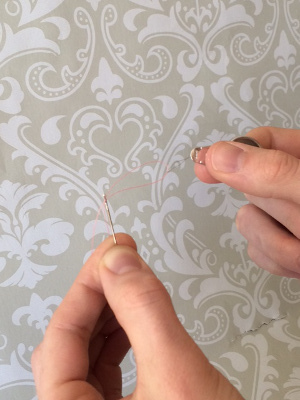 Now that the thread is pushed through the threader’s wire hoop, pull the threader back out of the needle. The wire hoop on the threader will then pull the thread through the needle. That’s it! You did it. Let’s see you sew. Has threading a needle ever frustrated you so much you cried? 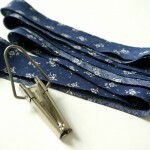 I know it sounds so simple….but would you please consider a post about how to properly tie a knot? I’ve seen some professional seamstresses do this so quickly I couldn’t figure out how they did it. 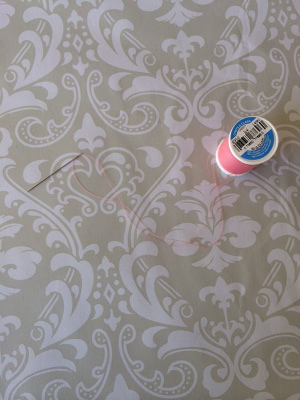 I get by with the method I know…but I’d appreciate some different ways to tie off your thread to begin sewing or even ways to make a knot once you’re done with a seam. Thank you! I keep breaking my needle threaders. What’s a good one to buy that won’t break so easily? wow I fell stupid. For years the needle threaded frustrated me along with my bad vision. I always put the thread in the loop before sticking it in the needle. I ran across you web site by mistake. 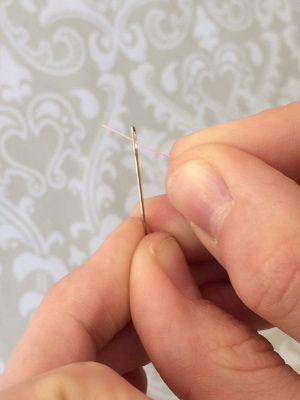 I was always ashamed to ask my daughter to thread the needle before I stitched anything.. I have learned a tip. The eye of the needle has a right and wrong side. The ” stamped” out metal side should be facing you as you thread the needle. I turn the needle until i locate the smoother, easier and faster side to thread. Learned this from a senior seamstress. Hope this makes sense.